Speed merchant Julien Epaillard (FRA) would take a convincing win in a blistering Longines Global Champions Tour of Rome speed competition this afternoon. Epaillard flew to the front as the penultimate class of the weekend unveiled a true challenge to the 35 competitors who took on Uliano Vezzani’s demanding 1.45m course. A delighted Julien said: “It started very fast. My horse has a naturally fast gallop, and it was enough to win today. I saw a couple of fast riders, and I thought to do five after the double of verticals, but six was ok and I’m very happy. I win more speed classes than Grand Prix this year!" First to go Alexandra Thornton (GBR) and Charielle were the first to go, and the first to set the pace - confidently flying around the arena to set the time to beat at 61.18s. However Pius Schwizer (SUI) soon bettered her time with Premiumares’ About A Dream, shaving milliseconds off the British rider’s time to stop the clock in 60.71s. Young talent Anna Kellnerova (CZE) put in a superb clear with Balguero, keeping the large horse’s rhythm in time all around the fast course and using his large stride to cover the distances. The pair raised the temperatures further, setting a new time to beat at 60.50s, with Kellnerova punching the air in delight. But it would soon be surpassed by Yuri Mansur (BRA) with Inferno, and then again by Julien Epaillard (FRA) with Usual Suspect d’Auge. The speedy French combination have always been quick, but were able shave seconds off the time, with what looked like an unbeatable 56.33s. Hopes were put on the shoulders of Emanuele Gaudiano (ITA) with Quinn van de Heffinck, the Italian speed demon always a dangerous contender. But a pole down meant he wouldn’t feature today, much to the disappointment of the local spectators. Mark McAuley (IRL) put in a valiant try with Miebello, but couldn’t match Epaillard, slipping in behind 57.93s. Another young talent Emily Moffitt (GBR) also produced a strong round on her impressive black stallion Copain du Perchet CH, stopping the clock in 58.38s. Marlon Zanotelli (BRA) was deceptively quick on Isabeau de Laubry, close but not close enough in 57.03s. 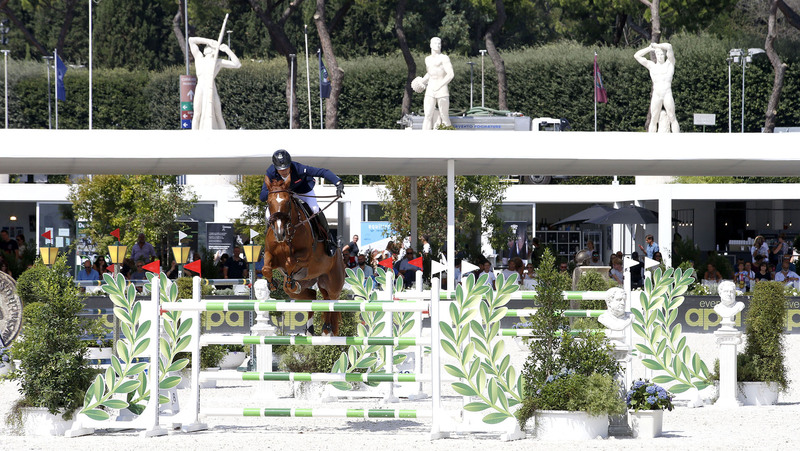 In true French fashion Roger-Yves Bost (FRA) and Castleforbes Talitha whipped around the daring course in 58.04s to snag fourth place, but it would another speed class win for Julien Epaillard (FRA) on the 15th leg of the LGCT calendar. Further action is still to come in the CSI 5* 1.50m at 14.30hrs local time so tune in GC TV or Facebook Live and don’t miss a moment!